← Is Artificial Sweetener Poisoning You? Somehow we keep coming BACK to this topic! The most common, cheap cleaning agents in the huge bulk of cleaning products available are these two. They are actually used in industry for cleaning things a LOT more resistant to their effects than the human skin and body in general. Read on and then just go check the ingredients in your bathroom cabinet contents. This inexpensive detergent is commonly used in cosmetic cleansers, hair shampoos, bath and shower gels, bubble baths, etc. 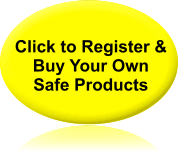 – It is probably the most dangerous ingredient used in skin and hair-care products. In the cleaning industry SLS is used in garage floor cleaners, engine degreasers, car-wash soaps, etc. It is very corrosive and readily attacks greasy surfaces. Sodium lauryl sulfate is used throughout the world for clinical testing as a primary skin irritant. Laboratories use it to irritate skin on test animals and humans so that they may then test healing agents to see how effective they are on the irritated skin. Is potentially harmful to skin and hair. It cleans by corrosion. Dries skin by stripping the protective lipids from the surface so it can’t effectively regulate moisture. Another extremely serious problem is the connection of SLS with nitrate contamination. SLS reacts with many types of ingredients used in skin products and forms nitrosomines (nitrates). Nitrates are potential cancer-causing carcinogenics. Because of the alarming penetrating power of SLS, large amounts of these known carcinogens are absorbed through the skin into the body. A variation of SLS is SODIUM LAURETH SULFATE (Sodium Lauryl Ether Sulfate- SLES). It exhibits many of the same characteristics and is a higher-foaming variation of SLS. It’s also worth bearing in mind that the mouth is one of the most absorbant areas on the body – and these items are in toothpaste. Some say this is scare-mongering? Well, so be it, but I know what I prefer to think. Please ask the person who directed you to this page what you need to do, or contact us directly here. You may have arrived at this page from a web link given by a member of the Healthy Homes Club. While this section of the site is being developed fully, you will need to contact them for more information, please, or get in touch using our contact form here.